Number of pages: 195 p.
Today I am participating in the book blitz for Frost. I recently finished reading this book so I felt like I needed to support this author a little bit more! It is really worth reading! My review will follow later this week. In the icy, monster-plagued world of the Frost, one wrong move and a person could end up dead—and Lia Weaver knows this better than anyone. After monsters kill her parents, Lia must keep the family farm running despite the freezing cold and threat of monster attacks or risk losing her siblings to reassignment by the village Elders. With dangers on all sides and failure just one wrong step away, she can’t afford to let her emotions lead her astray. So when her sister finds a fugitive bleeding to death in the forest—a young stranger named Gabe—Lia surprises herself and does the unthinkable. She saves his life. Giving shelter to the fugitive could get her in trouble. The Elders have always described the advanced society of people beyond the Frost, the “Farthers,” as ruthless and cruel. But Lia is startled to find that Gabe is empathetic and intelligent…and handsome. She might even be falling in love with him. But time is running out. The monsters from the forest circle the farm at night. The village leader is starting to ask questions. Farther soldiers are searching for Gabe. Lia must locate a secret organization called the Thorns to help Gabe escape to safety, but every move she makes puts her in more danger. Is compassion—and love—worth the risk? 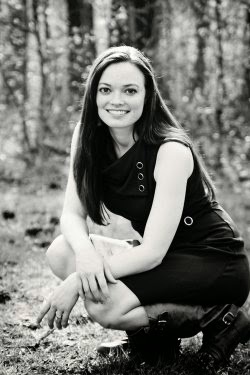 Learn more about my writing and books at my blog, find teasers for upcoming works on my Facebook page, and subscribe to my new releases newsletter to be notified of new novels as soon as they hit stores! 1. How did you get the idea for The Frost Chronicles? 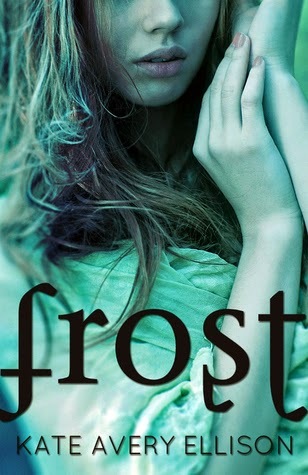 Frost was originally supposed to be a short story set in the world of another book series that I have yet to write. In that version, Gabe’s character had magic abilities, and Lia started out as an orphan living alone (eventually I added a brother, Jonn, but he was much younger). In the first version, the Frost wasn’t very frosty either. It was an evergreen, mountainous region, not the frozen wasteland from the final version. Basically, the whole thing was unrecognizable except for the core story of a girl who helps a boy fugitive despite her misgivings about it and her social conditioning to fear him. 2. Where do you like to write? I usually write at my local public library, or a coffee shop near my house. I like to lose myself in the noise and atmosphere of quiet hustle and bustle—it keeps me focused and somehow filters out my own mental distractions. When I’m at home, I tend to procrastinate with Youtube or Netflix too much. 3. What’s your favorite thing about the main character, Lia? She is kind of ruthless, and I like it. She’s strong and determined to do what needs to be done. I admire that. She lives a hard life and she’s a survivor, but at the same time, she’s able to change and become a better person because of her experiences. She isn’t brittle or inflexible. I usually start with an outline, or something that you might call an outline if you squinted at it just right. I hate outlining, but it’s a useful way to organize preliminary thoughts and make sure you have a clear direction for the story. 5. Are you anything like Lia, personality-wise? Not really, other than the fact that we’re both logical in our thinking, and I think we share a fierce desire to protect the people we love. I’m a lot more like Ivy. I love taking care of animals, reading books, and daydreaming. Growing up, I was always that kid wandering around with her head in the clouds. Not very Lia-like. Then I sort of ignore the outline and just start writing. I almost always write in order from start to finish, but it depends on the book. If there’s a scene I’m itching to write and I see it all perfectly in my head, I might skip ahead and get it down on paper. When I’m done with the first draft, my editor and my beta reader get their hands on it, give me feedback, and then I revise. Rise and repeat. Most of the writing process comes down to revision and editing. 6. The series is finished. Are you writing anything else for the Frost world? I’m actually planning to work on one more novella set in the Frost, told from the perspective of Anne, Lia’s friend. Her story evolved into something very interesting over the course of the series, most of it behind the scenes, and I think it’s something that would be fun to explore further.